Deb's Cup of Tea: Score! The game plan was to go to Mariano's and then to Target and then to CVS. I needed a few groceries and I needed to pick up a new prescription for the pain in my right leg. I had only one thing on my mind at Target. Target employees had dismantled over 80% of the Valentine's display by the time I walked into the store at 9:15 a.m. Easter M&M's have been artfully arranged on the end cap where, the week earlier, Valentine bags of pink, red and white sat. I nearly panicked. I couldn't see any Valentine candy. Giving the employees wide berth, particularly the gal tasked with lowering an extending sign that just didn't want to collapse, I found the candy on a back set of shelves. 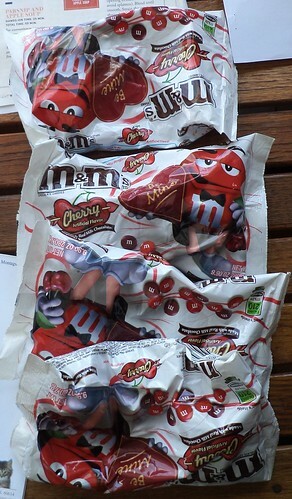 All the M&M's were lumped together, arranged by colored bags, but in one small section. There were probably 7 bags of these left. The sign said 30% off. Yes, I admit it. I was sorely tempted to grab all 7 bags. My favorite flavor has been the peanut filled ones, Mr. Yellow. But when I stumbled upon these 2 years ago, he was replaced. Thankfully, they are only available around Valentine's Day and I've only seen them in Target. Must be something between Target and M&M special flavors. (I think the bag on the very bottom of the Easter display was coconut. No thanks.) I only took 4 bags, however. It seemed wrong of me, no matter how much I like these, to take all that was left. Seven bags looked kind of greedy. I wouldn't have had that angst had they been down to the last 4 bags. MINE! So, I'm good now. I have not checked to see when Easter actually arrives, but I shall ration these and then head over to Target the day after for some pastel Mr. Yellow. With some luck, I can make these last through Easter, through spring and, perhaps up to Memorial Day.